Bank South Pacific (BSP) is naming right sponsor of the 7th Papua New Guinea Games to be held in Kimbe, West New Britain in November. The Host Organising Committee (HOC) made the announcement in Kimbe today.BSP Group CEO Robin Fleming said the bank is proud of its long term commitment to supporting sporting and cultural events around the country. "The values of sports such as sportsmanship, fair play, respect, courage and integrity that are showcased during the PNG Games are all key to ensuring we help unlock the potential of emerging athletes in the country," Mr Fleming said. He added, " It is with immense pleasure that we announce that the PNG games will be known as the BSP PNG Games 2016 WNBP and proud of being a part of the 7th PNG Games as Naming Rights Sponsor. It is the bank's commitment and goal is for its successful staging and completion." "We continually support such national sporting and cultural events because at BSP we inspire, we change, and we live our values and we lead by example. We work with, and for, each other; we progress together," he added. The Games are an exciting PNG sporting event and brings together young sporting talents to show. BSP Brand Ambassador, Toea Wisil, who is now a national hero, is a product of the PNG Games. "We see the potential in all the thousands of athletes that is why BSP is committed to work with the HOC to promote the 7th PNG Games in a positive and inclusive way," Mr Fleming concluded. HOC Deputy Chairman Hon. Dacca Wagai thanked BSP, its CEO Mr. Robin Fleming and the Board of Directors for the Bank's continued commitment in supporting sports in the country. On behalf of the Government of West New Britain and its people and the Host Organising Committee, Mr. Wagai expressed gratitude and congratulates BSP as the Naming Rights Sponsor for the 7th PNG Games this year 2016. PNG Games is one such major event in the country that unites our diverse nation through sports. Athletes from throughout the country converge to display their hidden potentials in various sporting codes inclusively. Through sports we promote the true spirit of unity, positive values and identity as ambassadors of one's family, tribe, province and the country. Mr. Wagai also commended the Governor, Hon. 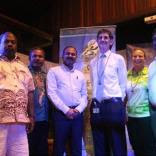 Sasindran Muthuvel for his foresight to accept the challenge to host this 7th PNG Games in West New Britain as an instrument drive development. We can now experience a lot of development taking place in our small Kimbe town, the schools and the surrounding places as we gear up for the games. The Host Organising Committee is committed and determined that preparations are progressing on schedule and we would like to assure BSP and other interested sponsors who would like to come on board that West New Britain will deliver the 7th PNG Games in November 2016.